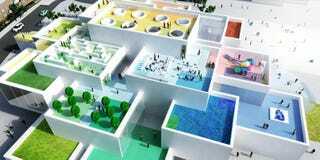 Lego maniacs have another pilgrimage destination to add to their list: The brand's new "experience center" broke ground in Billund, Denmark yesterday. As you'd expect, the building itself looks like it's constructed from a pile of Lego bricks. And thanks to a new Lego Architecture kit, you can start building your own version at home today. As we've reported before, the center is being helmed by Danish architect Bjarke Ingels and his firm BIG, who wanted to create a new hub for creativity in the city that also encouraged interaction and play. Accordingly, the exterior spaces will create a kind of Lego-like plaza that will invite the public to lounge and explore. Atop the structure is a giant reproduction of a Lego brick with round skylights that Ingels says will be recognizable from above. If the size and shapes of the center look familiar, that's because Ingels envisioned the project using the Lego itself as an actual building block that would drive the distinctive dimensions of the structure. "Lego proportions are really the golden ratio of architecture," he told Dezeen. Even the animation of the project uses Lego-inspired graphics. Thanks to the new Lego Architecture series, you can embark upon your own construction of the Lego House, which will probably be finished long before the Denmark building opens in 2016. The Lego House kit is a fairly honest reproduction of BIG's plans (although if that's supposed to be an architect he should be wearing black, right? ).